This Seattle-based couple had planned their cruise before they decided to tie the knot. 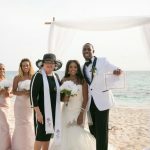 They had decided they wanted a very simple wedding while their cruise ship was in port. This fits the bill perfectly for Simply Weddings, as we arrange weddings for cruisers every week of the year. As an independent operator we are dependent on couples finding us through the web, and from comments made by satisfied customers. 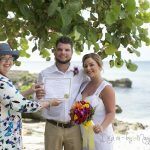 Your review of Simply Weddings is important to us, so please take a few minutes to tell other cruisers how we did. Thank you to all my couples who spread the word about Simply Weddings on the different cruise-ship forums. 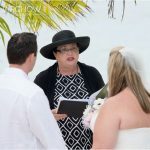 The Bride and Groom sign the certified copy of their Marriage Register while Joy looks on. 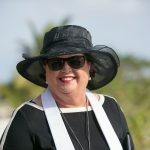 Peggy Moorhead, our Wedding Co-ordinator often acts as one of the witnesses which our Marriage Law requires. If you are traveling just as a couple, let us know so we can provide the two witnesses. 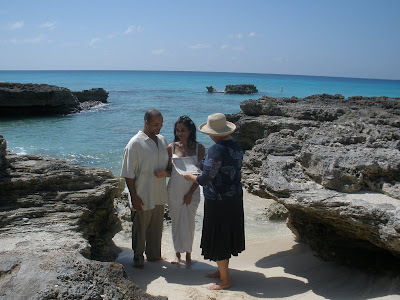 My Secret Cove is the most requested wedding location for cruise couples. Here Joy presents the couple with their decorated copy of the Marriage Register. 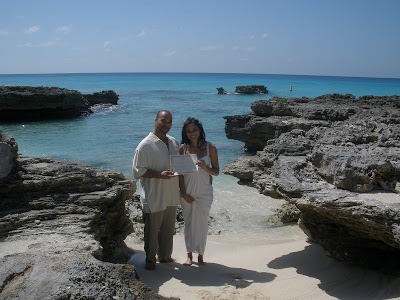 The newly-weds show off their marriage certificate and their happy smiles. In a few minutes I will take them back to the harbour, where they can explore George Town for a few hours before rejoining their cruise ship.